Murray McDavid are a ‘whisky bottler’, which means that although they aren’t a distillery themselves, they mature, blend and bottle whisky from across Scotland to produce their own distinct offerings. I’ve had more than a few of their bottlings before, and almost took part in their Twitter Tasting last year – until the Royal Mail conspired to spoil that plan. Happily, there were no such delivery hiccups this time around, so here goes with my traditional, semi-live blog / Twitter Tasting thing. 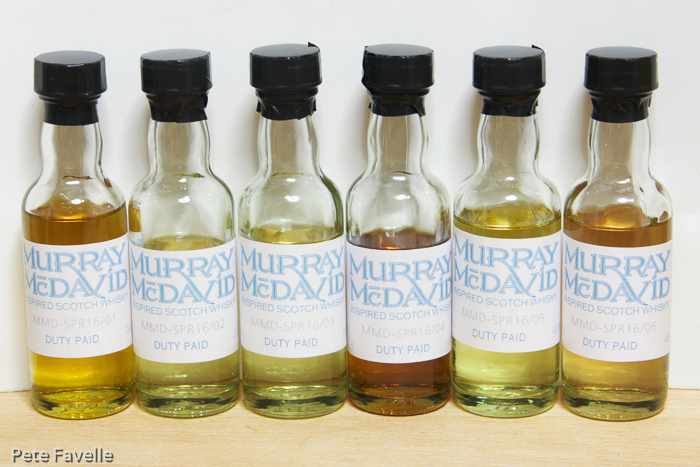 There are six drams tonight, all rather enigmatically labelled – so we’ll only find out what they are as we go! A golden dram, with a light, honeyed aroma and soft, sweet fruit – peaches perhaps. There’s some gentle wood lurking underneath too. Over time, the nose becomes creamier, with touches of vanilla. Twitter suggests more of a citrus edge than I’m detecting. Watered, I start to detect some lemon juice and there’s more of a grain dimension too. There might be a touch of fresh cut peat too, unless that’s the power of suggestion. In the mouth, I start to see the citrus character – spiced oranges, salted caramel and deliciously buttery, and fantastically drinkable. Water takes away some of the spice, and although it remains rich and flavourful, it’s definitely on to enjoy neat. We’re given some hints to the blend – a healthy cut of Speyside, a ‘large amount’ of coastal malts (“think Islay, think Orkney”). It’s been matured for 20 years in bourbon casks, although I’m not sure if that’s before or after blending! This is a remarkably pale coloured whisky, with a very curious nose – lemon cough sweets, and surprisingly heavy on the alcohol for a quoted 46% ABV. There’s some vanilla custard too, and although I’m not finding the rhubarb that others are, I definitely get some acidity. Someone correctly fingers it as malt vinegar. In the mouth it’s puzzling; acidic, creme brulee and little hints of darker fruits. Water cuts that acidity back, bringing out a creamier character. It’s nice enough, but I’m not falling in love with this one. The distillery is revealed as Invergordon, at 6 years old. It’s not a distiller I’ve tried before, and I’m certainly curious now. An even paler dram next, with a very ‘new make’ aroma – lots of barley and brown sugar, but remaining fairly lightweight. Someone mentions ‘sweat’ and I know exactly what they mean; it’s not a negative, although I can’t imagine many companies using it in their official tasting notes! Time opens up some green apple notes too, and water even more so. Water also exposes some lemon rind notes. Fellow tasters suggest grassy notes, but I’m not really getting it. In the mouth it’s youthful and a little harsh – the impression of fresh spirit comes through even stronger than on the nose. Despite that, it’s very nice – fresh crisp fruit, a little sugary sweetness, a nice warmth. It’s revealed as a 7 year old whisky, which surprises a number of my fellow Twitter Tasters – it tastes even more youthful, but that doesn’t take away how nice it is. The strongest whisky of the evening at 50% ABV, and also the darkest. The nose is unsubtle; full of bonfire and heavy oil, like an old shipyard. Below that is some dark caramel sweetness, blackcurrants and raisins. Water softens up the peat, and brings out a deeper, old driftwood character. Cold smoke in the mouth, more raisins and a lingering finish full of sea spray – a wonderful, full-on Islay dram. Watered, there’s more sherry and it’s just damn, damn tasty. Very quickly identified by smarter drinkers than me as a Bowmore, it’s apparently 14 years old and still ageing in the cask. Murray McDavid, you’re teasing us – and Twitter clearly agrees with me, with plenty of folks pleading for them to bottle it already! Back to the pale side, this is another Islay dram. More peat than smoke, with damp moss, heather and herbs. Twitter offers up ‘dusty’, and I can see what they mean. Water brings out more smoke, and a spirit-soaked oak aspect too. Heather honey on the tongue, with quite a restrained smoke behind it – gently powerful, sweet and oh so nice. Water again exposes more smoke, but otherwise doesn’t spoil the gloriously drinkable nature. If it wasn’t for the wonderful SPR16/04, I’d have called this my favourite dram already! Guesses bounce around the island; Kilchoman chimes with my initial thoughts on the aroma, but on tasting I’m more inclined to go with the crowd and call this as a Caol Ila. And so, obviously, it’s a Laphroaig. The last dram of the evening has a distinctly pinkish tinge to it. The nose is youthful again, but with decent fruity edge – redcurrants and earthy peat, with some nice sweetness below. Water exposes a lot more smoke, and sweeter fruits. In the mouth there’s a wonderful mix of sweetness and smoke; light red fruit with a bonfire just lurking beneath the surface. Twitter throws up strawberry laces, which perfectly sums up the sugary fruit sweetness I’m getting. At only 4 years old, the pink comes from a Madeira cask and, I’m guessing, brings a lot of that fresh sweet fruit. To the considerable surprise of most of Twitter, it’s revealed as a Speyside! Overall, this was a fascinating collection and I’d happily buy a bottle (or a cask?!) of at least half of these! 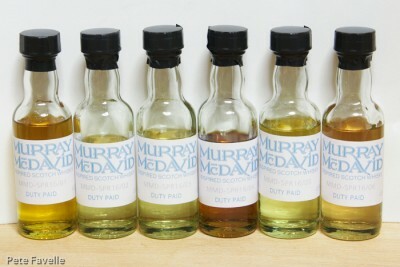 Many thanks to Murry McDavid for organising this evening’s Tasting, and inviting me along!